Our Flashback Friday this week commemorates Armistice Day in the Copper Country. 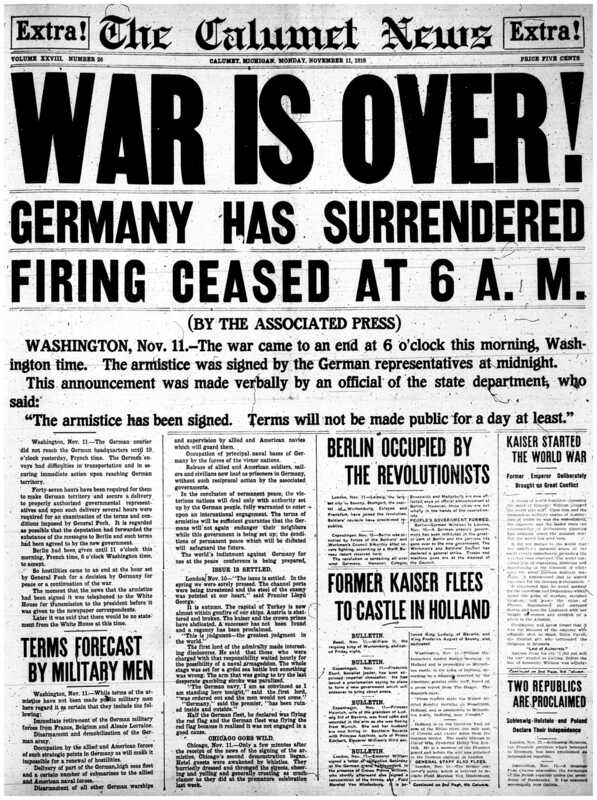 At the eleventh hour of the eleventh day of the eleventh month of 1918, peace finally came to the Western Front, ending four long years of warfare and bloodshed. Italian American family in front of their house in Baltic on Armistice Day, 1918. 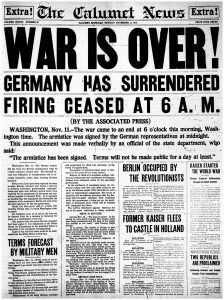 The Calumet News, front page of the extra edition following news of the armistice agreement, November 11, 1918. Interested in learning more about the soldier experience in the trenches during World War I? Be sure to check out the outdoor exhibit, “Dug In: Experiential WWI Trench” located on the Michigan Tech campus at the corner of US-41 and MacInnes Drive, while you can! The exhibit showcases an actual trench dug into the ground, which spans several yards along campus. Christopher Plummer and Sound Design students created the audio component to the exhibit, which incorporates recordings of “memorial poetry and selections from soldier memoirs” with simulated battle sounds. The exhibit will cap this Sunday, November 11 with a commemorative ceremony featuring the local VFW and American Legion groups, ROTC, and JROTC as they fill in the trench. You can more information about the event on Tech Today. Thanks to singer Gordon Lightfoot and his smash hit single “The Wreck of the Edmund Fitzgerald,” it’s a rare Michigander indeed who doesn’t know that Lake Superior “never gives up her dead when the gales of November come early.” The Fitz is the most recent lost freighter and undoubtedly the most famous, but it is far from the only large ship to be wrecked on the vast, powerful lake. As the Copper Country braces for the arrival of this year’s gales of November, let us take a look back at just a few of the other vessels that Superior has claimed. The most adventurous of Great Lakes divers will recognize the name Kamloops. The steamship, a package freighter, was bound from Hamilton, Ontario, to the Thunder Bay region in late 1927. Among the cargo was special machinery imported for a Canadian papermaking company and a substantial amount of food, including rolls of Lifesavers candies. When the Kamloops entered Lake Superior from the Soo Locks on December 3, it paused to wait out a wintry squall. Unfortunately, this wise decision to avoid one storm placed the Kamloops directly in the path of another as it neared Isle Royale three days later. It seems that the ship either capsized under the burden of waves and ice or, blinded by the falling snow, sailed unknowingly onto the reefs surrounding the island. Searchers did not locate any sign of the Kamloops nor its crew of 22 men and women until the following spring, when the bodies of nine people were discovered on the nearby shore. They had donned lifebelts and fought their way to land in a lifeboat, only to perish while waiting for rescue. Fifty years after the sinking, in the late summer of 1977, divers finally found the hull of the Kamloops itself, lying on its side in two hundred feet of water just off Isle Royale. Map from a Daily Mining Gazette article showing the locations of notable shipwrecks near Isle Royale. The site of the Kamloops is noted in the north central part of the map. Isle Royale was the site of another notable wreck a little over forty years before the Kamloops went down. The Algoma, launched in 1883, was a steamship operated by the Canadian Pacific Railway and described by one observer a century later as “modern and capable even by today’s standards.” The steamer had electric lights throughout, a remarkable feature in the 1880s, and its hull was equipped with watertight compartments advertised as a sure way to prevent sinking. If this sounds faintly like a certain 1912 shipwreck in the Atlantic Ocean, it should. What felled the Algoma was not an iceberg, however, but a natural feature on Lake Superior. On November 5, 1885, the ship departed Owen Sound, Ontario, in Lake Huron, en route to the north shore of Superior. Driving winds and freezing rain from one of the lake’s famous storms pummeled the Algoma as it neared Isle Royale. Miscalculating his ship’s proximity to the island due to low visibility and limited navigational aids, Captain John Moore unwittingly ordered the vessel be sailed over craggy rocks that obliterated its rudder and sent it into a vicious roll, scattering lifeboats uselessly into the lake. Vicious waves continued to break off pieces of the Algoma, which remained hung up on the rocks that had doomed it, throughout the night. Eventually, the eleven survivors managed to launch the last remaining lifeboat and a number of crude rafts, which carried them to relative safety on Isle Royale’s Rock Harbor. At least thirty-seven other souls aboard the ship were lost. The SS Algoma was no stranger to rough seas on Lake Superior. The year before it sank, the ship was photographed arriving at its destination with a heavy coat of ice, courtesy of waves breaking over its railings. The close of World War I brought one of the most unusual and mysterious Superior sinkings. In late 1916, the thick of the war, the French navy had ordered a large number of minesweeping vessels to clear their ports of explosives left by the Germans. The ships were to be built near Thunder Bay, Ontario, and sailed across the sea under French command after a formal commissioning. Two of these minesweepers, the Cerisoles and the Inkerman, were completed in September and October 1918, respectively. When sister ship Sevastopol was launched in late November–after the war had ended–the three began their journey toward France. The course their commanders plotted would take them past, yes, Isle Royale, around the tip of the Keweenaw Peninsula, down along the south shore of the lake, and finally downbound through the other lakes. Unfortunately, the weather, always capricious on Lake Superior, had soured by the time the minesweepers passed Isle Royale and headed for the Keweenaw. According to an article written by amateur historian Richard Rupley, winds reached gale force, wet snow fell in sheets, and “waves mounted into dark mountains of crushing water,” forcing all hands into a battle with the elements. 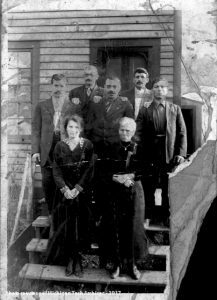 No one has ever determined precisely what happened that dark November night, but when the Sevastopol drew up along the leeward side of the Keweenaw, it did so alone. Some delay in reporting the disappearance of the Cerisoles and Inkerman undoubtedly added to the mystery, but the lack of obvious debris or victims in the water made the investigation even more challenging. Weeks of searching uncovered only a few possible pieces of flotsam and sketchy reports of potential sightings or distress calls. Even investigations several decades after the sinking, conducted with the best of modern technology, could not locate the final resting place of the minesweepers nor of the seventy-eight men on board. Just in time for the centennial of the loss, however, a team of researchers is preparing to try again. Perhaps this time will be the charm. The Navarin, a sister minesweeping ship to the Inkerman and Cerisoles. Both lost vessels would have been essentially identical in appearance to this one. Will the gales of November come early this year, especially around Isle Royale? Some would say that we had our first taste in October, but the forecast for the time being seems to call for smoother sailing. Let us hope that this shipping season on the Great Lakes passes uneventfully, bringing everyone on the waters safely home. 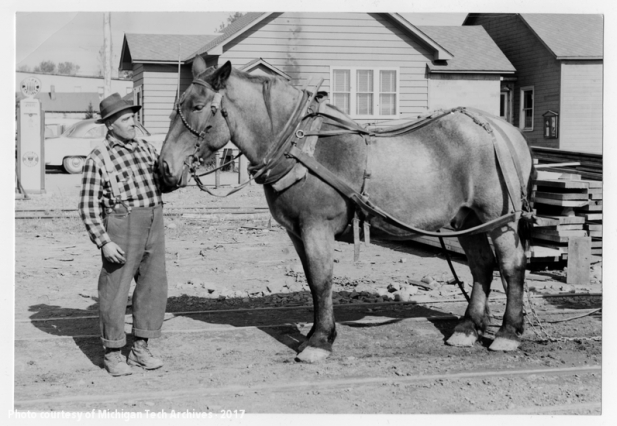 Mr. Ludger Belanger and his horse, Prince pose at the White River Lumber Company in Bergland, Michigan, October 24, 1953. From the Daily Mining Gazette Photograph Collection. Today’s Flashback Friday takes us to this week in 1953. A great still image of Ludger Belanger and his horse, Prince, pays tribute to the Upper Peninsula’s rich logging tradition. Both Belanger and his horse Prince worked for the White River Lumber Company of Bergland, Michigan. 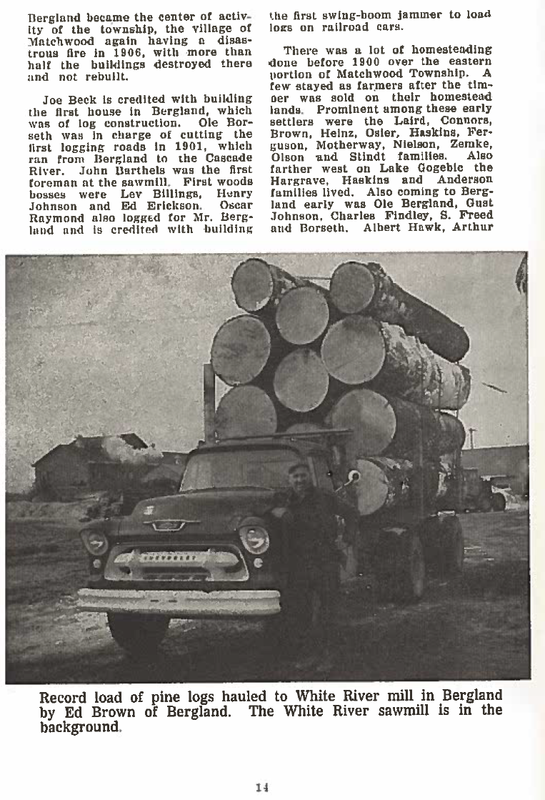 Record load of pine logs hauled to the White River mill in Bergland by Ed Brown. Date unknown. near Sidnaw, Michigan, purchased a large tract of timber land west of Lake Gogebic in 1900 and decided to move his operations to that area. The lake was a key asset in floating logs to the sawmill. The tract was rich with hardwood, hemlock, and some stands of pine. Although the heydey of pine logging from the 1880s and 1890s was over, hardwoods were coming into more general use and lumberman were quick to turn their attention to those types of forests. 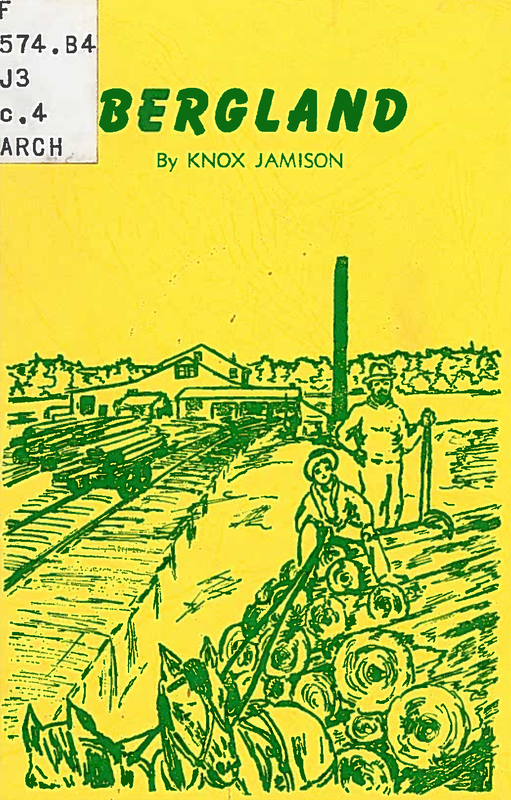 A copy of Bergland, by Knox Jamison available at the Michigan Tech Archives. hemlock timbering activities just north of Lake Gogebic accelerated greatly. In 1903 he built a sawmill on Lake Gogebic, so logs no longer had to be shipped by rail to Sidnaw. After the sawmill, shingle and lathe mills were also constructed, with operations running day and night. In the early 1900s four lumber camps cropped up around the growing industry. 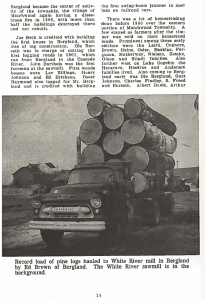 Thanks to G. A. Bergland’s industrious nature and his views on private ownership of businesses and homes, the town of Bergland turned into a bustling community of logging operations for many decades. 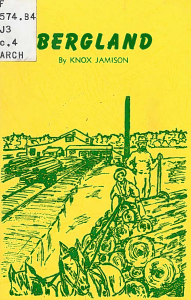 A brief history of the community, including reference to mineral extraction and the timber industry is available in the Michigan Tech Archives. 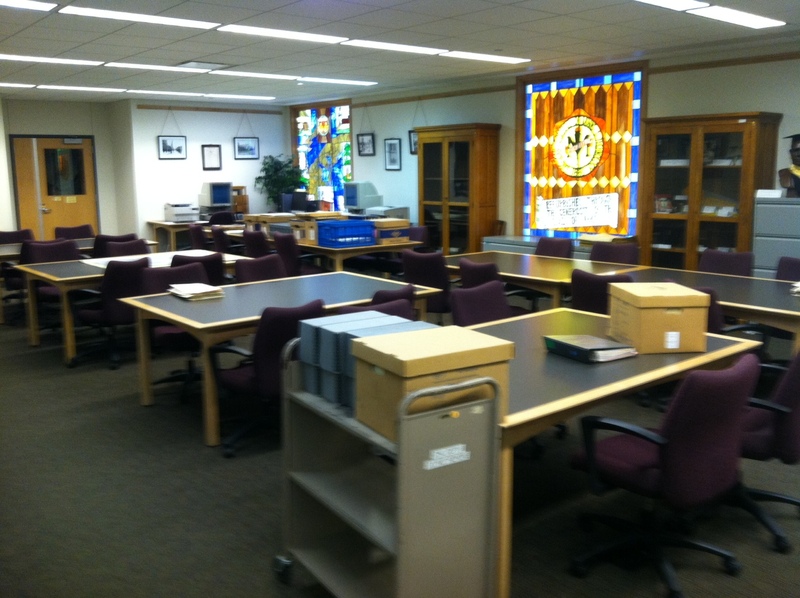 The Michigan Tech Archives has been having fun all month long for American Archives Month! The next week is no exception, with three special features taking place. Tomorrow, Wednesday, October 24 at 4 p.m., travel grant recipient Wesley Thompson will be giving his presentation in the East Reading Room of the Van Pelt and Opie Library. This is event is free and open to the public. Refreshments will be served. For more information about Thompson’s talk, please see our initial blog post about the event. In addition, this week our University Archivist, Lindsay Hiltunen will be a guest Instagrammer for the Society of American Archivists (SAA) Instagram page. Hiltunen is an active member of SAA, belongs to the Legislator’s Research Team, a subgroup of the Issues and Advocacy section of SAA, and she recently delivered a paper at the SAA annual meeting in Washington, DC which was held August 12-18. Lastly, next Tuesday, October 30, at 6 p.m. in the Opie Reading Room, the Michigan Tech Archives will launch a new exhibit on the history of the Copper Range Railroad. Stay tuned for a detailed blog post later this week discussing the event. We hope you will consider joining us for one, or all, of these special events to help us celebrate American Archives Month. For more information about any of our programs or activities, please contact the archives at (906) 487-2505 or by e-mailing copper@mtu.edu. We’re using our Flashback Friday this week to honor the changing seasons. No, we don’t mean saying goodbye to fall, but farewell to road construction season! 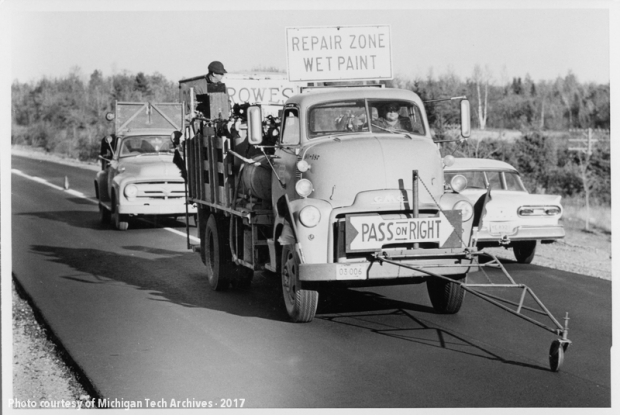 This week back in 1958 saw the end of a big highway paving job between Quincy and Calumet, which the Michigan State Highway Department christened with the addition of yellow and white lines, pictured here. The Daily Mining Gazette reported that “sunshine, an infrequent visitor in the area in recent days, made the painting project by…motor propelled machinery impossible” following paving two weeks prior. No doubt, many motorists in the Copper Country were happy to have the work, completed by the Thornton Construction Co., come to an end and to have the roads reopened for fall color tours up the peninsula . We know the end of road construction means the beginning of our winter months and its own set of driving frustrations, but imagine all that glorious snow that’s on its way to the Copper Country! Enjoy the lingering fall colors, motorists! 2018 Travel Grant Recipient, Wesley Thompson. Please join us for visiting scholar Wesley Thompson at 4:00 pm on Wednesday, October 24 in the East Reading Room of the Van Pelt and Opie Library on the Michigan Technological University campus for his travel grant talk, “Banking on Copper: An Analysis of National Bank Financial Health and Copper Production within Michigan’s Native Copper Mining District.” This event is free of charge and open to the public. Refreshments will be served. In this presentation, Thompson will guide the audience on a journey through the economic history of the region. Though one of the most studied mining districts within the United States, the history of Michigan’s Copper Mining District remains fertile ground for innovative and relevant research. Of particular interest is the district’s economic history and the relationships between the local mining firms and the district’s professional service firms. This presentation will take a novel approach of examining the history of the region by exploring the empirical relationships that existed between the district’s National Banks and the local mining firms. 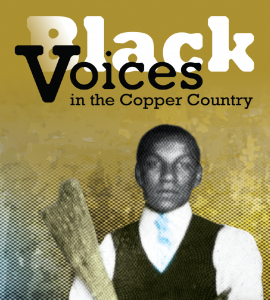 Specifically, this presentation will analyze the symbolic and mutually profitable connections found between copper production and the health of the banks. Wesley R. Thompson is an accountant currently working at a firm in metro Detroit. He received his MBA and Masters in Finance from Walsh College of Business. 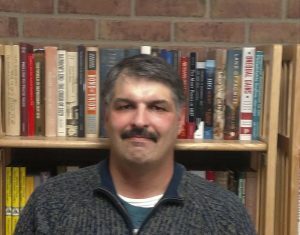 He also received his Bachelor’s in History from Wayne State University and his Masters in Historic Preservation from Eastern Michigan University. His passion for mining history comes from his family’s past of working in both Michigan’s copper mines and West Virginia’s coal mines. 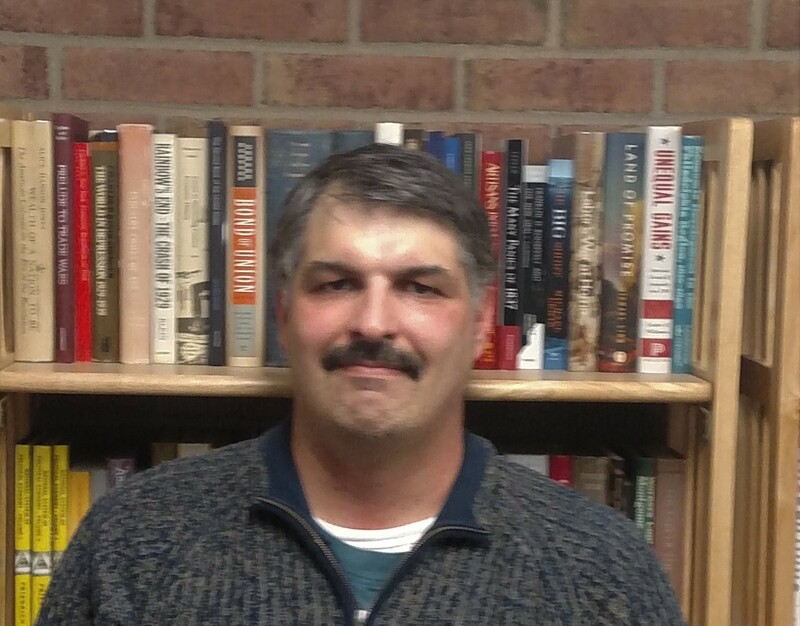 His historical interests include historic preservation, economic history and architectural history. He is also interested in assisting communities in creating economic growth through public history and heritage tourism. At 7:37 tonight, the puck will drop in the opening game of the 2018-2019 season for the Michigan Tech Hockey Huskies. 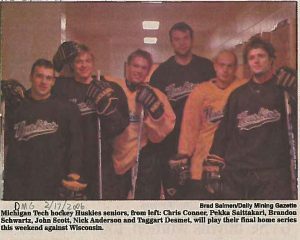 A team of veterans–fresh off the second consecutive WCHA Men’s championship–and eager freshmen will take the ice in brilliant Tech black, gold, and white, hoping to defend their title for yet another year. 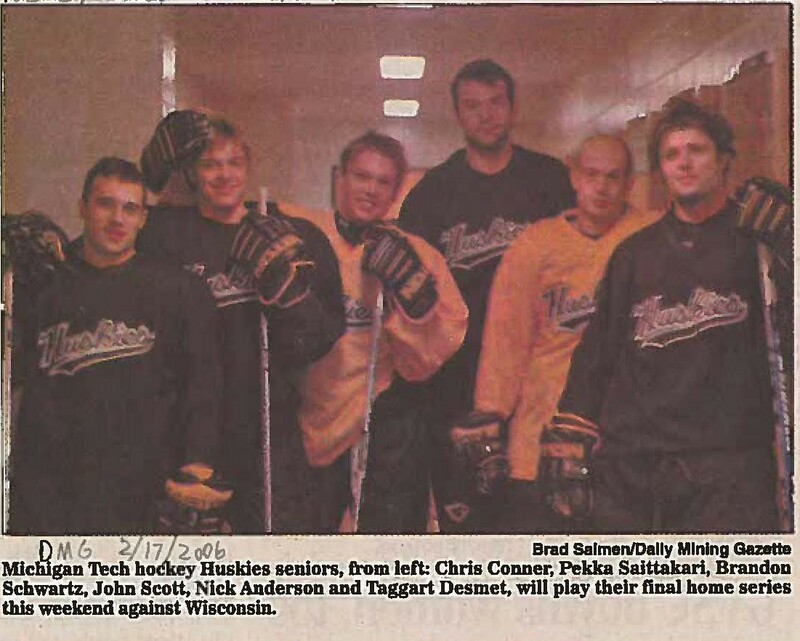 Many famous figures in the world of hockey have worn the Michigan Tech jersey over the years. Tony Esposito, now part of the Hockey Hall of Fame, played goalie at Tech and helped to propel the team to an NCAA Championship in 1965. Mel Person, one-time Huskies head coach and now leader of the University of Michigan men’s hockey program, suited up as a forward between 1977 and 1981. Randy McKay, an alumnus later who later served as an assistant coach at Tech, put his name on the Stanley Cup twice as a part of the New Jersey Devils. Lately, however, conversation about well-known Hockey Huskies has centered around a name that has surprised many outside Michigan Tech circles. John Scott, who started at Tech in 2002 and received his mechanical engineering degree in 2010, rose to a new degree of national prominence in January 2016 through the most remarkable NHL All-Star Game in recent memory. As a professional hockey player, Scott had gained a reputation as an enforcer, a player who was unafraid to deliver hits, start fights to motivate his team, physically punish opponents who endangered a victory, or protect star players from enforcers on the other team. Forwards participating in the All-Star exhibition match were expected to be drawn from the NHL’s most remarkable players in terms of goal scoring and playmaking–traits for which Scott, with five NHL goals to his name, was not known. Taking advantage of the rule that allowed fans to vote for All-Star team members, viewers colluded to prank the NHL by casting votes en masse for Scott. Scott was initially reticent to the fan campaign but ultimately decided to take the place awarded him following a sudden trade, assignment to a minor league affiliate, and unwelcome remarks from an NHL official concerning the effects of playing in the game on Scott’s children. Over the weekend of competition, Scott scored two goals and was honored as the event’s Most Valuable Player. 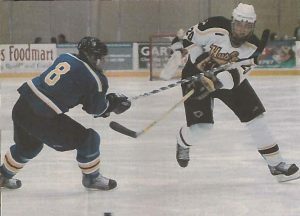 Anyone who followed the NHL in 2015-2016 had to have heard the John Scott All-Star story, but few have taken a walk back through the Michigan Tech Archives to discover the John Scott Husky story. Scott’s first year on the hockey team went without much reporting by either campus or community newspapers, thanks in part to a shoulder injury that sidelined him for several games. As the rookie became a veteran, however, his dedication to his teammates, his physical talent on the ice, and his cheeky quips off it garnered him press attention. Journalists took one awed look at the 6-foot-7 Canadian then playing defense and chose a slew of colorful adjectives to describe him. “Hulking” turned out to be their favorite. Scott proved a valuable addition to the Huskies blue line. By his own admission in his autobiography A Guy Like Me: Fighting to Make the Cut (co-written with Brian Cazeneuve), he joined a team that was struggling to put up wins, especially in the first two years. From day one, wrote a local reporter, Scott was a “tower of strength” on the team. In his absence following that freshman-year shoulder injury, “the Husky defense looked dazed and confused.” In 2005, the Tech coach was quoted as saying that Scott was “our best penalty killer” and that his no-holds-barred playing took “a tremendous load off of the rest of the defensive core.” Although “offense [was] not a big part of his game” and defense was his primary focus, when he scored, observers noted, “it counts.” His first goal as a college player broke a tie against the talented University of Minnesota Golden Gophers. Other articles over the years recorded key moments when Scott knotted up a game with a “greasy goal” against a big rival or a highlight-reel wrist shot received from a teammate’s no-look pass. As the end of his college career approached, it was clear that Scott’s presence on the ice made a world of difference for his fellow Huskies. John Scott, for your grit, your lip, and your heart, both on the ice and off–we’re proud to claim you as a part of Husky history. 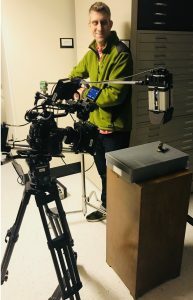 Travel Channel crew member filming in the Michigan Tech Archives stacks. The Michigan Tech Archives, in cooperation with Travel Channel and Michigan Tech’s University Marketing and Communications, are happy to announce an upcoming episode of Travel Channel’s Mysteries at the Museum, which will feature a few stories from the Upper Peninsula of Michigan. “Murder at Greystone, Paulding Light and Tumbleweed Tycoon” premiers Wednesday, October 10 at 8:00 p.m. ET/PT. Mysteries at the Museum features host Don Wildman who digs into the world’s greatest institutions to unearth extraordinary relics that reveal incredible secrets from the past. Through compelling interviews, rare archival footage and arresting recreations, the show illuminates the hidden treasures at the heart of history’s most incredible triumphs, sensational crimes and bizarre encounters. Filming break in the archives stacks. a pesky plant that turned into a Kansas woman’s cash crop. 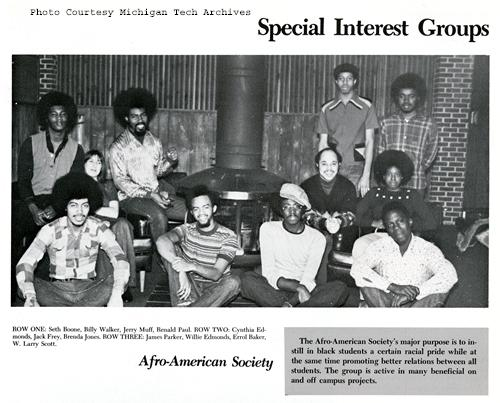 A short segment will also include a feature from the Michigan Tech Archives. For more information about the show, please check out Travel Channel’s website. Research and filming were conducted on campus, including in the archives last December. For more information about the Michigan Tech Archives or the show, please contact the department at (906) 487-2505 or by e-mailing copper@mtu.edu. The Archives can also be found on Facebook, Twitter, and Instagram. Former university archivist, Theresa Spence, discusses Old Reliable, with author, Larry Lankton, 1982. 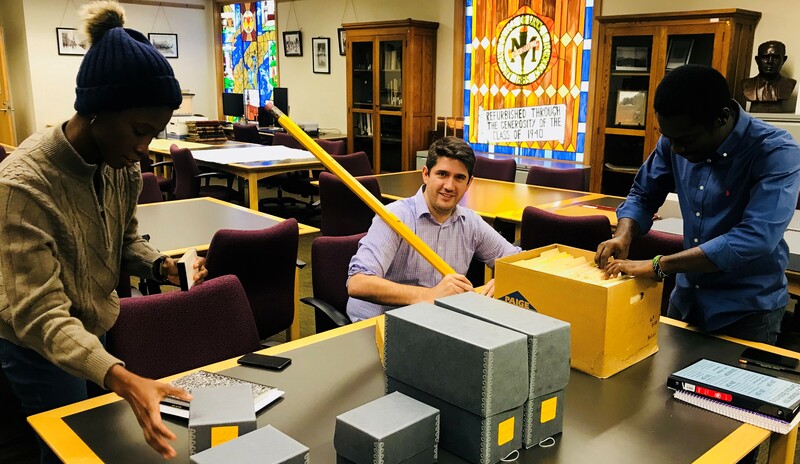 Since October is American Archives Month, our first Flashback Friday of the month pays tribute to all the archivists that have ever worked to collect, preserve, and provide access to the archival materials and special collections at Michigan Tech. 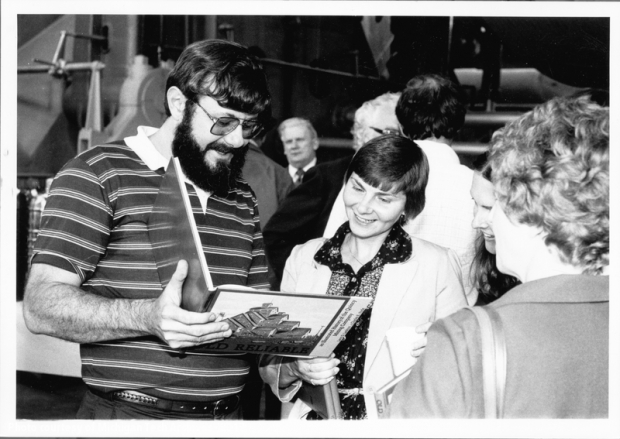 The photograph from August 1982 prominently features our first university archivist, Theresa Spence, speaking with author and professor emeritus, Larry Lankton at Author’s Day at the Quincy Mine. Larry was promoting his new book, Old Reliable, which was co-authored by Charles Hyde. From left, Larry Lankton; Theresa S. Spence; librarian Amanda Binoniemi; and archives assistant Kay Masters. 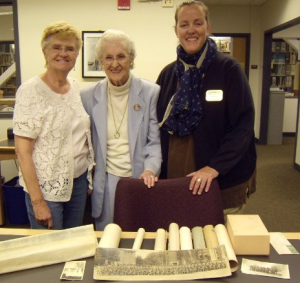 Former archivist, Beth Russell poses with the Raymond family, who donated a collection to Michigan Tech in 2014. 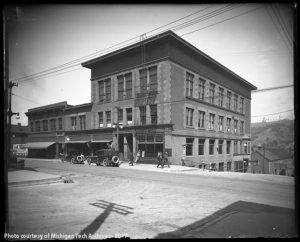 The Michigan Tech Archives has a long history that traces back to the early years of the university. The Upper Peninsula copper boom was more than forty years old when the Michigan Mining School (now Michigan Technological University) first opened its doors in the 1880s. In the early years of the school, A.E. Seaman, professor of geology and mineralogy, was given the responsibility for purchasing sets of mining, geology, and engineering journals. As time went on, more titles were sought to build the library and efforts were made during the 1930s to separate important historical titles from the general library stacks. Space limitations prohibited active solicitation of other local history collections at this time. 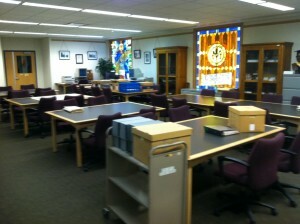 The current archives reading room, in the Garden Level of the Van Pelt and Opie Library. archives reading room at Michigan Tech opened to the public in July 1966. With the new space came the first real stimulus to actively solicit local history materials. Michigan Tech signified its commitment to an active archival program in 1978 with the hiring of Theresa Spence, the first professionally trained archivist at the university. The department quickly developed the procedures and policies necessary to solicit and make available premier collections pertaining to the history of Michigan Tech and the local region. 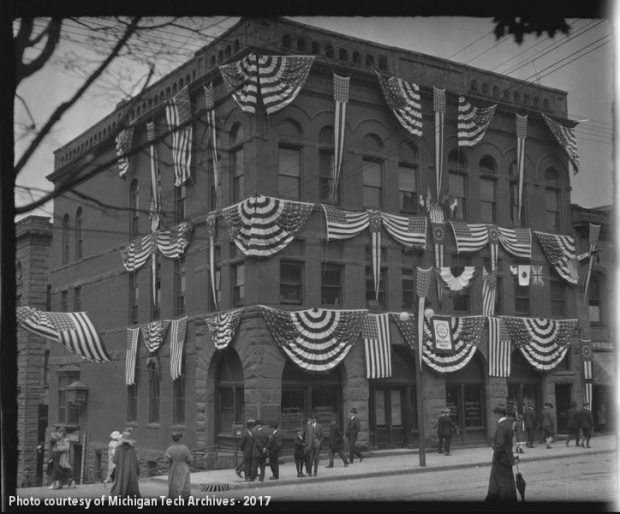 The department formally adopted its current name, the Michigan Technological University Archives and Copper Country Historical Collections in 1980. The department continues to grow and has seen many wonderful professionals and support staff throughout its long history. 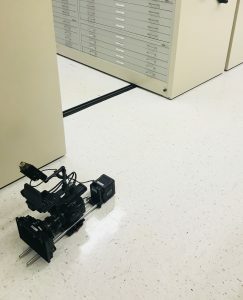 The Michigan Tech Archives is actively growing and currently has three professional archivists, one archives assistant, and one student assistant to protect the collections and provide research support and other services. If you have any questions about the Archives or American Archives Month, please contact the department at (906) 487-2505 or e-mail copper@mtu.edu. 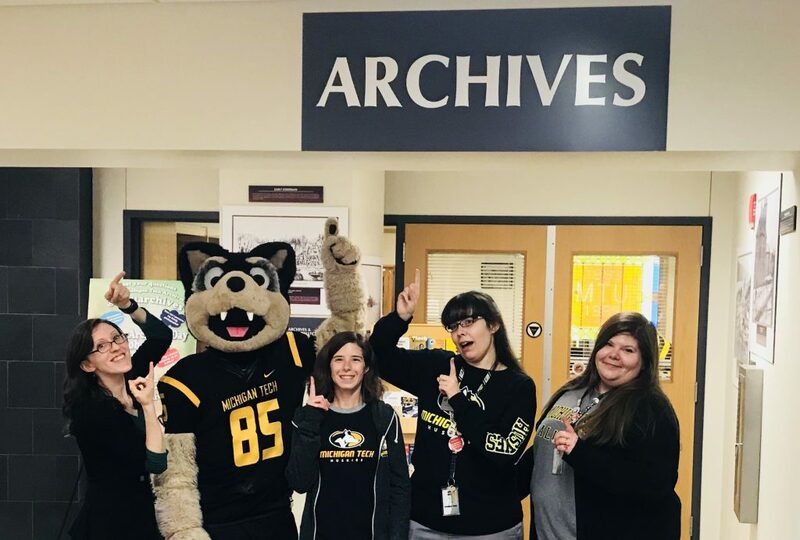 The current archives team poses with Blizzard T. Husky on #AskAnArchivist Day, 2018. From left, Allyse, Blizzard, Allison, Emily, and Lindsay.